Drawing from his meticulous research during seven years of study with the FBI's legendary profiling unit, Alan Jacobson brings dramatic realism and unprecedented accuracy to his pages as he takes readers behind the scenes of the FBI Academy. 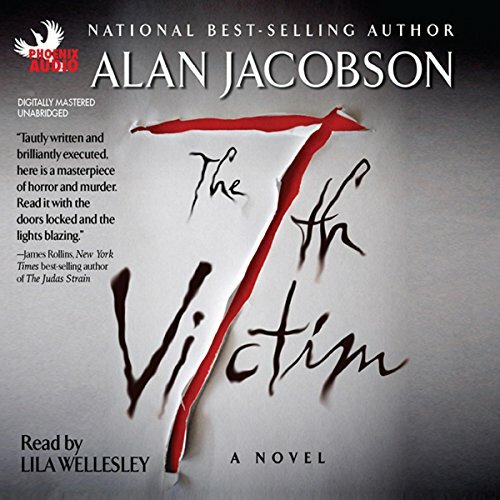 The 7th Victim is a terrifying and memorable work of psychological suspense, with rich, believable characters and a chilling intricate plot that will keep you guessing until the end. I was looking forward to find a new series to listen to, but was very dissapointed with 7th Victim, in fact I didn't even finish it. For the first time on an audiobook I skipped to the last chapter just to find out "who did it". The author lost me when he had the main character go on with the investigation when her child was in ICU saying "the hospital will call me". Started a little slow, but the pace, plot and the "whodunnit" factor had me hooked. Great finish and a nice surprise ending. Performance had quite a few errors, but the story was not negatively affected. The story is "Criminal Intelligence" with a twist. Very well done. I really enjoyed this audiobook ... until the ending. While it certainly was an intriguing resolution, it seemed 'rushed' (compared with the time devoted to other aspects of the plot), and, in my opinion, let down what was, overall, an interesting novel with engaging characters and pleasant narration by Lila Wellesley. The main story is about the "Dead Eyes" killer, a serial killer who mutilates his/her victims and paints on the wall in their blood. The hero/main character is Karen Vail, a FBI profiler. Karen is in a custody battle with her ex-husband - this creates situations that don't seem believable. The physical fights between Karen and Deacon, her ex are tiresome. When her son is injured, it's unrealistic how she fits hospital visits into her schedule. Also she is falling in love with a fellow officer, finding out about her past, putting her mother in a nursing home and seeing a lawyer regarding the custody of her son - all this during the investigation of the serial killer. Too much blah, blah when there should be lots of action. When I finally got to the action part, it just didn't draw me in or make me turn the pages. This is a good book but its a little drawn out. if you can get through the first 70 some chapters it picks up like a true thriller is supposed to. The 7th Victim kept me hooked the whole time! It had a great surprise ending!